We’d love your help. Let us know what’s wrong with this preview of Start Now! by Chelsea Clinton. 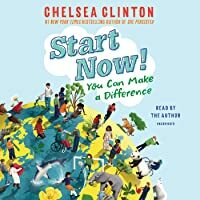 With information on problems both large a For the youngest activists among us, a book geared just for them full of facts, stories, and tips on how to change the world, from #1 New York Times bestselling author Chelsea Clinton. 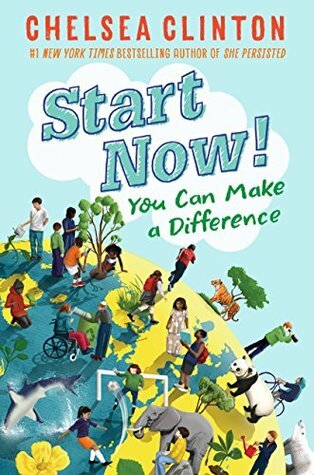 To ask other readers questions about Start Now!, please sign up. Be the first to ask a question about Start Now! I think it's a great thing for notable people to write books on kid activism. I was at Chelsea Clinton's book signing event at Bookshop Santa Cruz and it's obvious she has a lot of traction in my community. I'm sure she's inspired many a youngster to change their world. This book is definitely targeted for the 4th - 8th-grade student. The text is simple and direct and, sometimes, disjointed. Clinton acknowledges several editors/reviewers who are in her target age range so I assume I'm just a tad I think it's a great thing for notable people to write books on kid activism. I was at Chelsea Clinton's book signing event at Bookshop Santa Cruz and it's obvious she has a lot of traction in my community. I'm sure she's inspired many a youngster to change their world. 1) Not as bad as her other book I reviewed because in this book it doesn't matter if she is a privileged white girl because it's nothing more than facts. 2) It's nothing more than facts. 3) Doesn't go into enough depth for any of those facts to really matter. 4) Maybe give some kid a little bit of inspiration to pursue one of the topics, however, I highly doubt that. Just not very engaging. 5) This book was published because it was written by Chelsea Clinton if it had been written by "Joe Blow" it wouldn't have been touched with a ten-foot pole. Yeah! Mini-review written. I better hit submit really quick here so that it finally gets saved and the world can officially see the review that I'm sure everyone has been sitting on the edge of their seats waiting for!!!! Kids often ask "how can I help?" This book can answer that question in a variety of ways with practical suggestions at the end of each chapter! Chapters broadly include information on: environment, animals, health, food and hunger, bullying. Chelsea is an inspiration when it comes to standing up to bullies in a gracious and civilized way. She does this every day on twitter. Index in the back. Photos of children who have made a difference are included in each chapter. This was a great, short book suitable for all ages, but geared towards youth. It offers a lot of practical information for a healthy environment and lifestyle. I found inspiration for changes that I would like to make. Will likely purchase it for my youngest. So great and I got to meet her and get my book signed! Information about ways to make a difference when you're in upper elementary and middle school. Clinton explains clearly and presents possible action steps in each chapter. This is definitely meant for kids! I checked this out at my library and it was pretty good! Covers everything from clean water, why you should wash your hands, endangered animals, bullying.....very interesting and well written. I'm scoring this more generously. I liked the theme but found the content to be really basic. Great book for young activists. Enjoyed the audio version but the author’s speed of talking might be a bit fast for some listeners. Looking forward to seeing the illustrations in the print version.